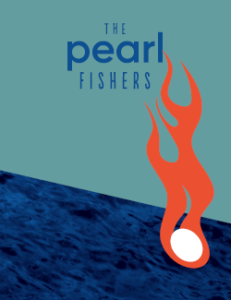 Lyric Opera of Kansas City concludes the 2018-2019 season with Bizet’s sensuous and exotic The Pearl Fishers, April 27, May 1, 3 and 5 at the Kauffman Center for the Performing Arts. The opera will be sung in French with English subtitles. The Lyric Opera season concludes with a trip to the ancient island of Ceylon, where a forbidden love threatens both the prosperity of a civilization and a vow of eternal friendship, in The Pearl Fishers (Les pêcheurs de perles). Georges Bizet composed it 12 years beforeCarmen, but his brilliance was already evident in this early opera. The famous friendship duet “Au fond du temple saint” is the opera’s most celebrated touchstone, although The Pearl Fishers also features a lush orchestral treatment and thrilling chorus and dance sequences. This wildly colorful production from San Diego Opera was designed by Zandra Rhodes, the iconic British designer who dressed Princess Diana and the musical artist Prince, among others. The Pearl Fishers brings multiple Lyric Opera debuts, including Maeve Höglund as the priestess Leila, John Moore as Zurga, and Christian Zaremba in the role of Nourabad as well as the entire creative team including Conductor Antony Walker, Director Andrew Sinclair, Choreographer John Malashock and Set and Costume Designer Zandra Rhodes. Andrew Sinclair has directed this production several times; Antony Walker is Music Director of Pittsburgh Opera and Artistic Director of Washington Concert Opera. Höglund’s roles include Susanna in Le nozze di Figaro and Musetta in La bohème; Moore has sung Zurga in several productions, and Zaremba recently debuted at The Metropolitan Opera as Angelotti in Tosca. Sean Panikkar (Silent Night, 2015), will return to sing Nadir. Tickets to The Pearl Fishers start at just $29 and availability varies by performance. To purchase tickets, call Ticketing & Patron Services (816) 471-7344 or visit kcopera.org. Patrons can select their own seats and print their tickets at home by visiting kcopera.org. Limited student rush tickets are available for $15 starting 90 minutes before the performances, with a valid student ID. The Pearl Fishers is sponsored in part by the Lyric Opera Circle. 1. A mere twelve years after The Pearl Fishers, Bizet was to shake the very foundations of the operatic world with the most revolutionary opera ever produced—the violent and passionate Carmen—a work so far ahead of its time that only later generations could truly appreciate it. 2. Zandra Rhodes, the “Princess of Punk” was made the Commander of the British Empire in 1997 and has nine honorary doctorates from universities in the UK and the USA. Also, her hair color is famously fuschia. 3. The most famous duet in The Pearl Fishers, ”Au fond du temple saint”, was the pop culture hit of the time. One unattainable priestess’s beauty – and her responsibility to protect the island from evil and storms – once broke up a friendship between a pearl fisher and the island chieftain. When the men pledge that she will not come between them again, it happens anyway – and sets their world on fire in more ways than one. Bizet’s pre-Carmen work is a blazing beauty, filled with romantic drama, dancing, lush melodies, eye candy, and an unexpected twist. First Friday, April 5, from 5:30 to 7:30 p.m. Presented by Lyric Opera of Kansas City at the Beth Ingram Administration Building (1725 Holmes St., KCMO 64108). Monday, April 8 at 7:00 p.m. at the Kauffman Foundation (4801 Rockhill Road, KCMO 64110). South Asian cultures captivated the imaginations of European opera creators in the 19th century; this fascination continues even today. Join UMKC musicologist William Everett as he discusses Donizetti’s The Outcast to Lakmé to Bollywood films. This repertory also brings up difficult questions about colonialism and institutional racism on the musical stage. This lecture is free and open to everyone; RSVP requested at (816) 471-7344 or labrand@kcopera.org. Monday, April 15 at 7:00p.m. at the Kauffman Foundation (4801 Rockhill Road, KCMO 64110). France was the home of GRAND Opera, where everything was serious, and every note was sung; it was also home to COMIC Opera, where everything was cheerful and there was dialogue between arias. Then Bizet writes Carmen, and changes everything. Hear how Bizet bucked tradition, led by Linda Ade Brand, LOKC Director of Education/Engagement and her husband, opera super-fan Robert Gibby Brand. This lecture is free and open to everyone; RSVP requested at (816) 471-7344 or labrand@kcopera.org. Monday, April 22 at 7:00 p.m. at the Kauffman Foundation (4801 Rockhill Road, KCMO 64110). …and as a Chinese proverb has it, “Pearls lie not on the seashore. If you wish for one you must dive for it.” The Pearl Fishers is not as well-known as Carmen, but like the latter, it brims with great arias, a duet for the ages, wonderful melodies, stirring drama, and an exotic setting. Join Lyric Opera Guild preview speaker Don Dagenais to delve into the plot and musical highlights of this unique and beautiful work. This lecture is free and open to everyone; RSVP requested at (816) 471-7344 or labrand@kcopera.org. Join Conductor Antony Walker for a deep dive into the sumptuous score of Bizet’s The Pearl Fishers at the Beth Ingram Administration Building, 1725 Holmes St., Kansas City, MO 64108. FREE Event, RSVP required at https://kcopera.org/programs/community/explore-the-score/ or by phone at (816) 471-7344. Fri., May 3, 10:30 p.m.
After the Friday performance of The Pearl Fishers, all are welcome to join Young Friends of the Lyric to celebrate! Enjoy drink specials and perhaps meet some of the cast. Sun., May 5, 11:00 a.m. – 1:00 p.m.
All are welcome to join Young Friends of the Lyric before the Sunday, May 5 performance of The Pearl Fishers at Webster House for brunch fare before the show. The Lyric Opera Guild is a social and networking group who attend the Lyric Opera of Kansas City and enjoy the camaraderie of others who share their interest in opera. Guild Members participate in social and educational activities designed to expand friendships and appreciation of opera, and welcome members to the Guild Lounge at the Kauffman Center during Lyric Opera performances. Guild memberships start at $60 for individuals and $85 for family memberships; benefits vary by membership level. To join, visit kcopera.org/support or contact Ticketing & Patron Services at (816) 471-7344. Young Friends of the Lyric membership is $40 and includes benefits for two for a full 12 months. To join, visit www.kcopera.org/yfl or contact Ticketing & Patron Services at (816) 471-7344. Saturday, September 21, 2019 7:30 p.m.
Wednesday September 25, 2019 7:30 p.m.
Friday, September 27, 2019 7:30 p.m.
Sunday, September 29, 2019 2:00 p.m.
Saturday, November 9, 2019 7:30 p.m.
Wednesday, November 13, 2019 7:30 p.m.
Friday, November 15, 2018 7:30 p.m.
Sunday, November 17, 2018 2:00 p.m.
Saturday, March 7, 2020 7:30 p.m.
Wednesday, March 11, 2020 7:30 p.m.
Friday, March 13, 2020 7:30 p.m.
Sunday, March 15, 20120 2:00 p.m.
Saturday, April 25, 2020 7:30 p.m.
Wednesday, April 29, 2020 7:30 p.m.
Friday, May 1, 2020 7:30 p.m.
Sunday, May 3, 2020 2:00 p.m. Lyric Opera of Kansas City was founded in 1958; it is one of the nation’s premier regional opera companies and brings high quality live operatic performances to the people of the Kansas City area and a five-state region. Repertoire choices encompass original language performances of standard repertory as well as contemporary and American operas. The Company mounts productions that enrich the community it serves, as well as reflect the highest artistic standards of the profession.